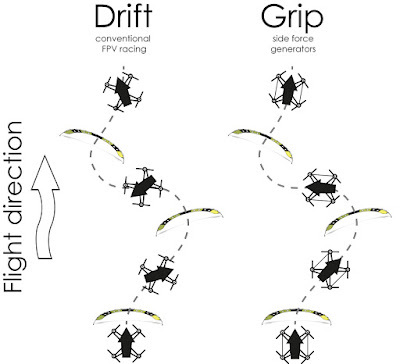 Summary: FPV racing multirotors with side force generators (SFGs), will drift less during turns, making them potentially faster on race tracks (watch the video comparison here). But the SFGs need the be carefully placed and dimensioned, so that aerodynamic centre and centre of mass are at the same position. Otherwise it will not work. Introduction Recently, I was thinking about how to improve the handling of racing copters. I noticed since quite a long time, that different copters behave quite differently in fast turns: Some drift quite a lot (especially when they carry a larger battery or an action cam), others drift less. I was always preferring copters that drift as little as possible. That is also why I am trying to reduce the weight of my copters as much as feasible.